Here’s a fun historical map showing how land use changed during the boom time heyday of the I-494 strip on the south edge of the Twin Cities. It’s from a chapter out of a book called “The Geography of Urban Transportation,” edited by Susan Hanson and Genevieve Giuliano. The chapter, by Peter O. Muller, is full of old school urban geography like this. Source, Baerwald 1976. “The emergence of a new downtown” Geographical Review, 68. Check out the whole chapter online here. I will quibble slightly with the claim that the 494-5 commons is “on the south edge” of the Twin Cities. The south edge of the Twin Cities metro — even if we limit only to continuous urbanized area – is Lakeville. This is 15-20 miles in from that edge, straddling the border of an “urban center”-classified and two “urban”-classified communities. 494-5 commons is also named as an Edge City in the book by the same name. As of 1991, it was the Twin Cities’ only such area. Of course, two nodes on the 494 corridor have grown enormously since then: Southdale and MOA/South Loop. The only major projects in the middle of the corridor that come to mind since the early 90s are Meridian Crossings (NE quadrant of 494/35W) and Best Buy (494 and Penn). As I wrote a couple of years ago, I wish we had any real strategy for a transportation solution that can fully support the land use potential and aspirations for the growth of the corridor. So far it looks like the main change will be another lane and an improved interchange. Welcome changes, but they will not move the needle. As Bloomington’s population over roughly that period indicates. When did the “new” 65 construction happen? 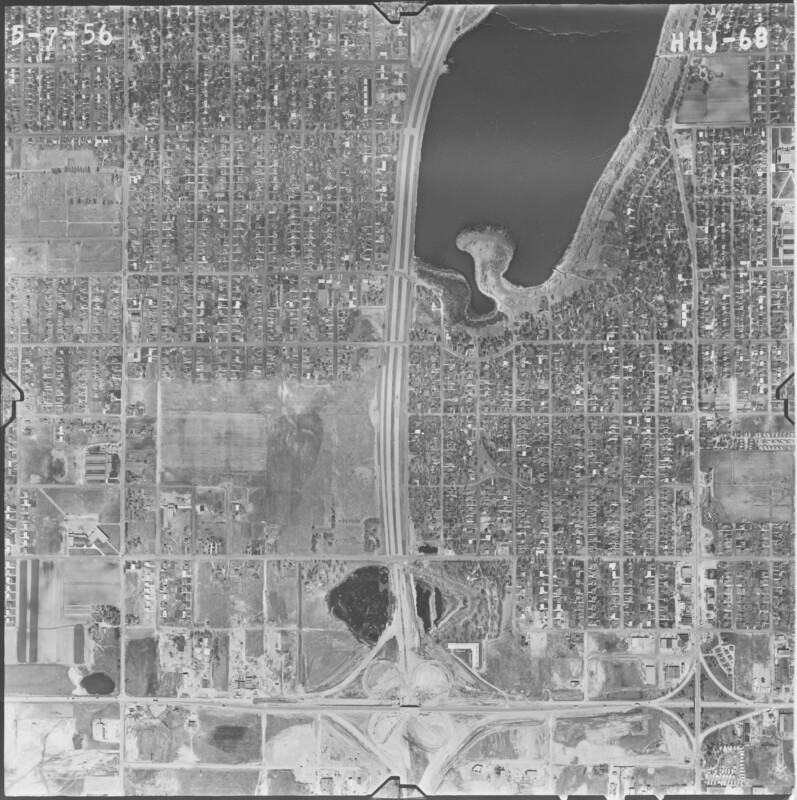 This 1956 photo shows what I assume was 65 done through Richfield (as an at-grade expressway), and an interchange with then-Hwy 100/now-494 under construction. Anyway, seems not unreasonable to label with the modern labels if the general highway alignments existed then. Also — brutal to see how just how hard they shoehorned in that new expressway along the shores of Woodlake. I am sure the map was made in the 70s, but you make a good point Monte! Bloomington’s been doing a lot of soul searching regarding their industrial areas. They recognize that decent jobs are important to the city contrasting with the market reality that most our industrial jobs, to the extent they’re not in China, are farther out than Bloomington due to cheaper land when it’s time to locate to a newer, more efficient building. All the industrial area on this map is “non-protected”, meaning Bloomington will consider rezoning it to something else if a request is made. The “protected” areas are the core of the areas east of Lyndale Ave and 94th and James, and the entire Hampshire and Old Shakopee area. Notably a few years ago they wanted to build a Target at Normandale and Old Shakopee. The city said “no” (although mainly because they don’t want big box stores that far away from the freeways, not industrial job loss).